Nintendo will be disabling the Nintendo "Wifi" system on May 20, 2014. After that date, players of the DS version will no longer be able to remotely connect to each other's wifi fields. The 3DS version should not be affected. Around Spring 21 of your first year, the Harvest Goddess will visit you in the morning and then transport you to her pond on the top of the mountain. She will tell you about the special crop field hidden in the water of her pond! To access this field, just jump into the water. This special field allows you to control a season-specific area. Setting the field's season is done by placing a seasonal stone in the upper-right corner box. Putting a Spring Sun into the box sets the field to spring season, a Summer Sun turns it to summer, and so on. You can only have one sun in the box at any time. You will get the Spring Sun once you unlock the special field. The others can be bought from the town shops; the Summer Sun is at Raul's Shop in Konohana, the Fall Sun is at Enrique's Shop in Bluebell, and the Winter Sun can be found in either shop. Each sun is 2000 G.
When you swap suns, any crops growing in the field's current season will wilt and die once you remove the season stone. Trees will be okay when you swap suns. The main purpose of this field is to earn income by selling access to the crops growing in your special field. This field isn't for you to personally grow and harvest crops. In fact, you can't harvest the crops you grow! You can grow any type of vegetable, flower, or tree, but you can't grow grains; the sickle tool is not usable in this field to prevent bad players from cutting your crops. The use of fertilizer is prohibited. Crops grown here won't wilt or die as long as you keep the sun stone in place, even if they aren't watered for long periods of time. You can connect your crops together for faster watering, just like with your farm fields. There are two versions of the game: DS and 3DS. The two versions can not connect to each other. The DS version can only connect to another DS version, and the 3DS version can only connect to the 3DS version. Before you can host guests, you need to give your Nintendo Wifi Friend Code to your visitors. For the DS version: You can find this code by going into the Connect menu from the game's title screen and then selecting the active save file you want to use. To obtain a Friend Code, use the Wifi Connect menu to tie your game to your DS console. 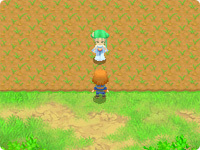 You will have the same Friend Code for both your save games, but you will have two separate goddess pond fields. Your personal code will be in your Friends List on the top screen. You can register up to 30 other players' code in your game; just press the Y Button to add another player's code to your game. For the 3DS version: Your Friend Code for the game will be associated with your 3DS console and not with the Tale of Two Towns game. You can find it by going into your Friends menu (the orange smiley-face on the touch screen) and then selecting your name from the list of friends. On the top screen your Mii, name, favorite title, and Friend Code will be displayed.